Remember the Time I Vlogged My Birth Video? Remember when posting a video of the womb dweller kicking was the bravest thing I had ever done online? Until, possibly stupidly, I promised to vlog my Womb Dweller’s birth!? Then my computer crashed before I could post it, letting me off the hook. But you guys started e-mailing me, letting me know I was indeed not off the hook. Well, my friends, today is the day! First, the audio is a little tricky. You’ll want to turn it up for the first half or so; and then, well, you’ll probably want to turn it way down. Just be prepared. Also, this is a birth video. I’ve seen, oh, probably 20 or more birth videos, and I’m just not a squeamish person. But if you are, please occupy yourself with some other activity during the brief seconds between 6:23-6:34. Although, thanks to modern technology, that segment is only seen through the very edited feature of black and white edge detection! Or, of course, you could just not watch the video at all. But the beginning is pretty funny and the ending is really precious, so I’d highly recommend it. *The song playing during the birth sequence is This is Life by Jared Anderson. Megan and Jared are personal friends, and I know you will be blessed by his faith and music. Author svalentePosted on April 19, 2009 Categories 3rd pregnancy31 Comments on Remember the Time I Vlogged My Birth Video? I’ve just experienced the three main types of birth: cesarean, birth with an epidural, and natural childbirth. It’s true, as the commenter pointed out, that I had delivered two babies (although at the same time) before my natural experience. One might think that would make the natural birth a little easier. And maybe it did. Oh please God I do not want to even imagine a more painful birth experience than was the final stage of my natural childbirth! But let me be perfectly clear: There is zero comparing this recovery with my last. I am in no pain versus the excruciating, tear-inducing pain of last time. During the last contractions of transition, and the actual delivery, I literally found myself thinking, “Epidurals are awesome! !” But as soon as #5 was born, I mean, the immediate second afterward, I could tell a huge difference. First of all, I knew I hadn’t torn. I had torn so much with my hospital vbac that it should have counted for five births. Two tiny babies…uncontrolled pushing…major tearing. One big baby with a 15 inch head….controlled (because I could feel everything) pushing….zero tearing. If I were to have another baby, I’m not completely sure I’d go natural (although I probably would). But I would be super aware when pushing and have a midwife there to help me. The controlled process is what has given me a pain free recovery. I’m absolutely convinced about that. No matter how odd I it might seem to some people. What about you? Sound off with your best and worst birth experiences. **Oh my goodness! How sad that anyone, anonymous or not, might feel criticized for their very personal birthing choices. That was certainly not my intent. I felt like a failure after my cesarean, and I really had to pray through that. And certainly, a vbac is not for everyone. I prayed about each of my births, and with God’s help, chose what was right for me. I can’t really imagine how anyone could feel criticized by my birthing comments though; because clearly, I am just trying to avoid pain. Ha! I didn’t birth naturally to be brave, I did it to avoid a cesarean. But yes, I was very pleasantly surprised with the outcome. So I figured, if she’s that interested in the gory details, even though she witnessed them first hand, some of you might be politely waiting on pins as well. Like I said, the birth was just perfect. I’m not going to lie, the contractions from about 9 cm through the delivery were positively mind-splitting. At first, I really didn’t know how I was going to push through them. But they showed me the crown of his little (15 in.) head in a mirror, and my desire to get that baby out of my belly and onto my chest finally took over. They even had to slow me down to avoid tearing. I think he was born about ten minutes from that point. After the delivery, I was blissful. He was perfect, I felt great, and we all just sat around and stared at him. I took bets on his weight and we all talked about what cousin or sibling he looked the most like. I delivered the placenta about twenty minutes after the birth. As far as I am aware, my uterus seemed to firm up right away. One of the midwives would check me every five minutes or so and, if you’ve had a baby you’ll know what I mean by, “mash away at my uterus.” I really hate that part! :) But instead of getting increasingly firmer, it seemed to be getting more and more “boggy”. One of the midwives (Joan) swept my cervical opening to check for retained placenta, and I’m pretty sure I yelled out louder at that point than I had during the entire birth. The blood that was released was estimated at 1.5 liters. I immediately felt faint and shaky, and Kiersten ran to call 911. I don’t remember feeling scared until the paramedics arrived. The midwives gave me a shot to help firm my uterus, started an IV, and put me on oxygen. From my perspective, the mood in the room was still calm and peaceful, although Kiersten has informed me that was not at all reality. They sure had me fooled though, professional through and through. My first time on an ambulance gurney was bizarre and scary, and it’s not an experience that I’d care to repeat any time soon. I was dizzy and barely conscious, and I felt like I was hoisted twenty feet into the air. Once in the ER, the doctor on call did another sweep through my cervical opening. She announced what she was going to do before she began, and I just started to scream and cry. I’ll blame my little fit on the loss of blood, but I was not happy. At. All. Then, she said that she needed to do another more invasive sweep, but that she would try to get some drugs through my IV in time. I tried to announce that they had not taken affect, but that didn’t seem to matter. Something about stopping extreme blood loss being more important that sparing me pain. Whatever. In no time at all, I was being wheeled to recovery. I guess the drugs had finally taken effect, because even my memories of the the faces in the room are veiled and blurry. But I do know who was there, and I am so grateful to each and every one of them. I remember my doctor hugging my midwives and everyone breathing a heavy sigh of relief. And I also remember the final blood loss being estimated at over two liters. I had a very graphic fantasy of a coke bottle full of blood, and I started to feel faint again. Then I slept for at least two or three hours. I couldn’t sit up straight for about nine hours, but while lying down I felt good, and I had even started to get some color back by dawn. I was given the option of not receiving any blood, but I was also assured that my recovery would be a long, anemic road. I took two units and was released around seven o’clock that same evening! I’m sure you all want to know, but I’m still not exactly sure what the problem was. I know I had retained some membrane that was finally recovered on the third (possibly fourth) sweep. But, basically, I just kept hearing that I had a “floppy” uterus. Considering how much it’s been stretched, and three times in the past four years, I guess that makes sense…but it’s still scary. I do not regret having a vbac in the birthing center. If anything, my faith in midwives has only been proved. It was so nice to hear the doctor commend them saying, “Well done.” and “Thanks for leaving me with so little to do!” I feel certain that I was able to have the birth I wanted and still be in the best possible hands. He was born just after midnight on Thursday morning, and by Friday evening I was ready to go out to eat for my thirtieth birthday! I’m taking it easy besides a few brief outings; but, after giving birth, it’s a nasty chest cold that is really taking me down. The older kids all have it, too, so please remember us in your prayers (especially if you’re up in the middle of the night!). More, just as soon as I can! Not taking the camera into Wal-Mart was a big mistake. I mean, the video would have been award winning (at least on a comedic level). Half-way from the van to the front door I asked Papa Bear to “Sllloooowwww doooowwwn!” I was starting to have contractions that I couldn’t fake my way through. “Do you want to just go straight to the center?” he asked. I had a few things to return, and I grunted through one contraction as the greeter tagged my items. Then, I winched through another as the customer service gal processed my return. Between contractions, I was fine (and amnesiac-ly forgetful). I wanted to look at pjs. I remembered all sorts of random things that we needed. Then a contraction would hit and I’d grab the cart and visit loopy town for about 45 seconds. I know people were looking at me in horror. Well, it serves them right. They’ve been staring at me like I was about to explode for about three months now! 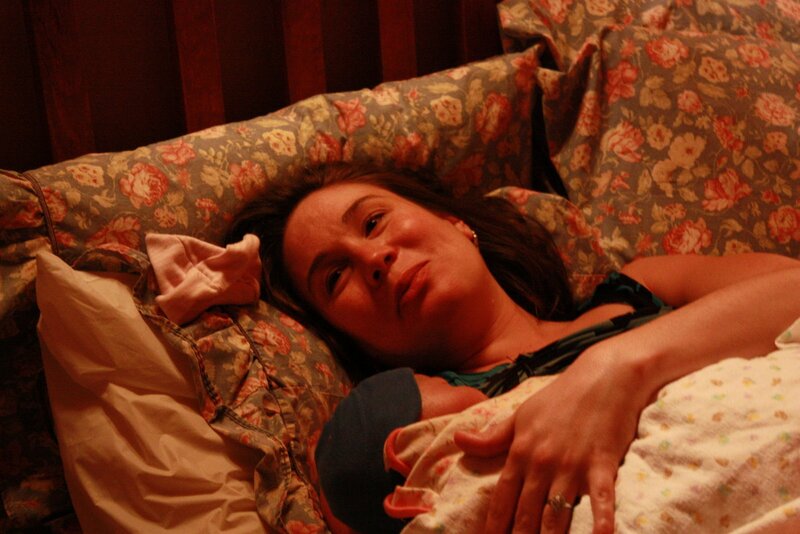 Before heading to the center, we called my parents, my good friend Rachel, and, of course, the midwife on call. My contractions were about 2.5 minutes apart, but they were only lasting 30-45 seconds. It was almost 7:00 pm. We showed up at the center laughing hysterically (although I can’t remember now about what). For the next three hours, that was pretty much the drill. In the time away, I had dilated to 7 cm! We were so excited and the mood was just perfect. By 9:30 or 10:00 pm, my birthing party had all arrived. I heard a rumor that someone in the living room didn’t think we were taking things seriously enough, and from that point on, I absolutely could not stop laughing (except every minute or so during the contractions). Never tell a silly person to get serious. It just doesn’t work! Around 11 pm, I began squatting though contractions. At one point, I really thought he was going to be born right there on the floor. But, as it turns out, natural birth is not that easy! Ha! The contractions were so intense by that point, and so close together, that I think I inadvertently kicked everyone but Papa Bear and the midwives out of the room. I’d have to say that natural childbirth was a little more intense than I had predicted, or at least than I had hoped. But what an incredible experience! My mind was literally swarming with Biblical analogies (none of which are clear on my first day postpartum). I specifically remembered Jennifer’s post about offering it up. I wanted to sob as I prayed that Jesus would be glorified through my pain. I can only hope that He was. It took about 30 minutes for me to push out our 8lb 6oz blessing. It only took me twenty-minutes to push out both Lil Prince and Bay Bit combined. I’ll write more about this later, but let me just say that the epidural might not be everything it’s cracked up to be. It gave me a completely pain free birth with my second set, but the recovery was weeks of horrendous pain. Today, just one day postpartum, I can honestly say I am in no pain at all. The baby formerly known as Womb Dweller emerged from his 38 week incubation at 12:15 am (fifteen minutes into his due date). I was ecstatic and felt absolutely wonderful. For about half an hour…. I have so much that I want to remember; so if this gets really long, I might need to write it in pieces. But first of all, how fun to open my e-mail this morning and see all the well wishes! Thank you! If you follow me on Twitter, you were probably pretty sure about what was happening yesterday. 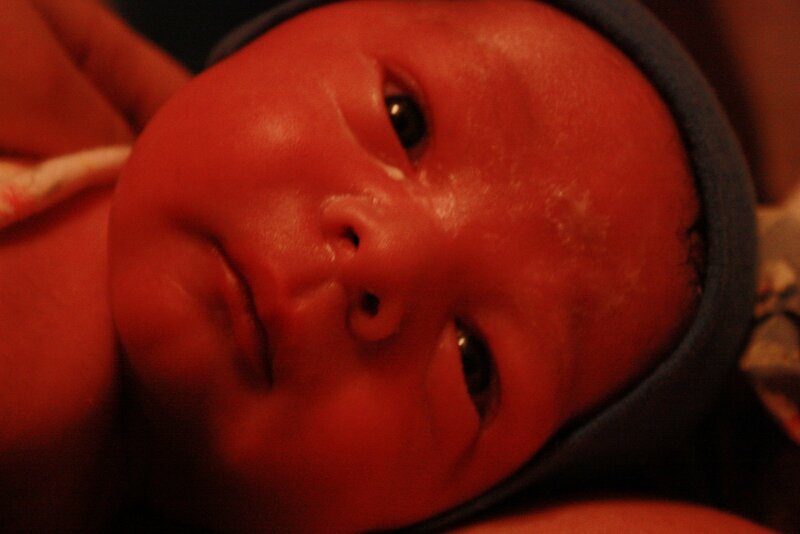 I received a call on Wednesday afternoon from one of my midwives. My liver profile had come back with borderline results. Nothing very concerning, but just one more thing that might have landed me in the hospital for a cesarean. She suggested that I come right in for a check and a sweep. I was pretty worried that I still hadn’t dilated and a sweep wouldn’t even be possible. But on faith, I decided to call Papa Bear back from the one day of work he had found this week, and we headed off to Taos leaving the kids at home with my mom. Now, I really wanted sushi, but I figured he knew that, so I left the decision up to him. “It doesn’t matter to me. Where do you want to go?” I said in my best lying voice. I started to dread going into labor with a belly full of pizza, and I almost insisted on sushi. But then I remembered reading about Italian restaurants who claim to induce labor. I assumed it had something to do with the Oregano and Basil, and since Outback has a wonderful fresh herb dressing. I thought that just might be God. I was dilated to three cm when she checked me at 4:00 pm. She did a pretty invasive sweep, and we all crossed our fingers. We arrived at the restaurant sometime around five. I ordered a salad with extra dressing and a slice of Basil Pesto pizza. Almost as soon as we left the birthing center I began to have contractions, but during dinner they grew stronger and came much closer together. I can absolutely promise that you will be inundated with pictures, details, and yes, the birth video over the next few days. But for tonight, I just wanted to let you know that all is well. We’re home now with our number five blessing (who was born at 12:15 this morning). I had a little scare which I will tell you about tomorrow, but everything is fine now. Thank you all so much for your prayers! Author svalentePosted on March 27, 2009 March 9, 2018 Categories 3rd pregnancy41 Comments on Guess Who? !